The notion that a machine-made violin from a Chinese factory has the ability to vibrate the same, therefore the ablity to produce a quality tone as does a Cremonese instrument hand crafted in the 1800s, is an idea that for many, strains the limits of credibility. But as illustrated by the studies described below, the science has consistently proven such a claim. 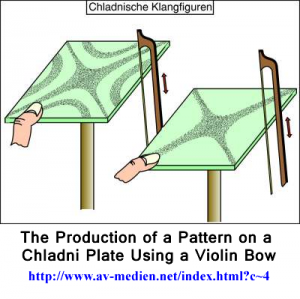 The first and most dominant mode in the violin is called the Air Mode, which is a Helmholtz resonance. 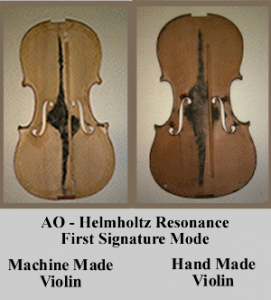 The illustration below shows where the AO Signature Mode forms on a machine- made violin, and on a handmade violin. It is easy to see that this first mode is one of the strongest – as it covers the front center section and the area around the f-holes of the instrument. It is also easy to see that this mode is very similar in strength for both violin qualities. Signature Modes of the Violin (Reprinted with permission from George Bissinger and David Oliver, “3-D Laser Vibrometry Laser Vibrometry on Legendary Old Italian Violins,” Sound and Vibration (July 2007):12, http://www.sandv.com/downloads/0707biss.pdf. Physicist George Bissinger, professor at East Carolina University, has done in-depth research on the violin Signature Modes. His studies on the modal qualities of the violin show that “all violins tested showed the same five Signature Modes below 600 Hz.”  According to Bissinger, “the ‘robust’ quality differentiator difference was the approximately 280 Hz, Helmholtz-type AO cavity mode.”  Therefore, if all violins contain these same five modes within the first position string range, then it must be possible that regardless of a violin’s monetary value, if the string is engaged in Helmholtz motion, the instrument has the capability of reaching its maximum tone quality. In yet another study, Kenneth Marshall characterized five low-lying normal modes (Signature Modes) that contribute to the overall response in the first position string region of the violin–nominally between 196 to 600 Hz. Marshall states, “these [five low-lying normal modes] have been seen for all violins tested to date, regardless of quality.”  Therefore, within the first position register on the violin, it should not make a difference whether a student is playing on an inexpensive, rental-quality instrument or a high-priced Cremona violin; the vibrational qualities in the wood are the same in both instruments. Beament, Marshall, Bissinger, and Hutchins all agree that the first five Signature Modes are present, and vibrate the top plate of all violins, in almost exactly the same manner, regardless of the quality of the instruments. In the beginning strings class, this register is the starting point for all string instruments. It is then the teachers’ responsibility to help students achieve the highest tone quality from their instruments by introducing Helmholtz motion at the very first lesson. Asking a beginning strings class to only play pizzicato until their first concert constitutes a disservice to the students and is an entirely avoidable and unnecessary hardship imposed on a strings student’s musical development. Donald L. Hamann, and Robert Gillespie, Strategies for Teaching Strings: Building a Successful String and Orchestra Program (New York: Oxford University Press, 2004), 134. Thomas D. Rossing, “Chladni’s Law for Vibrating Plates,” American Journal of Physics 50, no.3 (March 1982): 271. Johannes Courtial and Kevin O’Holleran, “Experiments with Twisted Light: Some of the Mechanical and Quantum-Mechanical Properties of Optical Vortices,” European Physical Journal -Special Topics (June 2007): 36, http://www.physics.gla.ac.uk/Optics/papers/authorPDFs/Courtial-OHolleran- 2007.pdf . Kenneth D. Marshall, “Modal Analysis of a Violin,” Acoustical Society of America 77 (February 1985): 697. George Bissinger, “Structural Acoustics of Good and Bad Violins,” The Journal of the Acoustical Society of America 124 (September 2008): 1754. I have a less expensive violin and it sounds pretty good. I am sure it would sound better with someone that knew how to play. It came with some standard strings and I noticed a remarkable difference when I changed to Thomastik Dominant strings. Have any studies been done comparing strings? Even my untrained ear noticed the difference right away. The figure showing the first free plate mode is incorrectly noted to be the A0 motion of the assembled violin. It is impossible to see the motion in the free plates of the A0, as it takes the closed air volume of the interiour of the violin along with the f-holes to produce that resonance. Also the text on the A0 (Helmholz resonance) in factory and hand made instruments is in general incorrect. Usually well built and old Italian violins have a stronger A0 than the usually stiff walled factory instruments. Good Morning, i’m really interested in this kind of sound research over acoustic instruments. Can you explain to me how you induct the resonance of precise (or a group of) frequencies over the instrument? Hi there,I check your blogs named “Helmholtz Resonance Signature Mode In The Violin – String Visions” like every week.Your story-telling style is awesome, keep doing what you’re doing! And you can look our website about proxy server list.